I will upload to Githup teh additions to the GHI SPWF04S driver. I think I had to use GHI’s code sign assembly? This I had to remove first to be able to use the GHI driver VS 2017 solution. The code to use the ST Socket Server I will post here. Here are some special thing to watch and use the WIND event in harmony. We have a lot of work done internally but can’t share anything yet. The guys made me promise. The guys made me promise. Gus, Gus, Gus… When has this ever stopped you ? 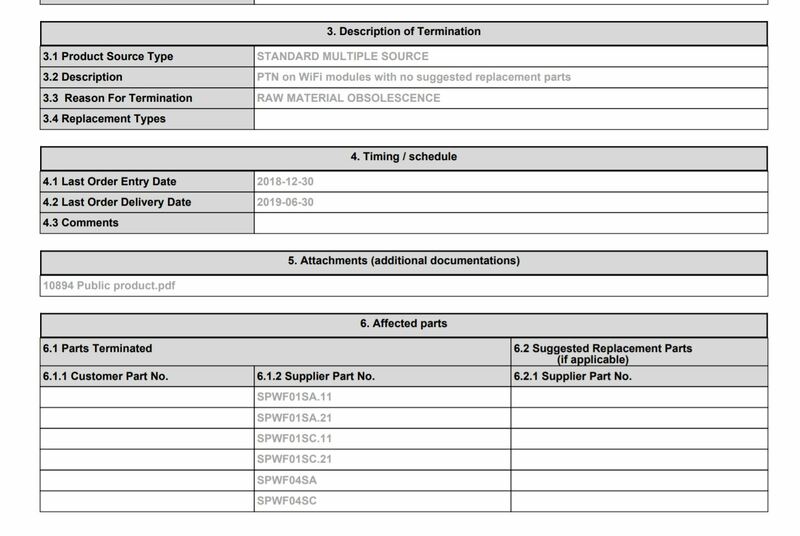 Should I ask at the ST forum about EOL of SPWF04S? Also just discovered that the with STS command the status of “reset_reason” allways returns 4 (=hardware reset). Gives the FEZ board a hard reset to the Wifi module at power on? 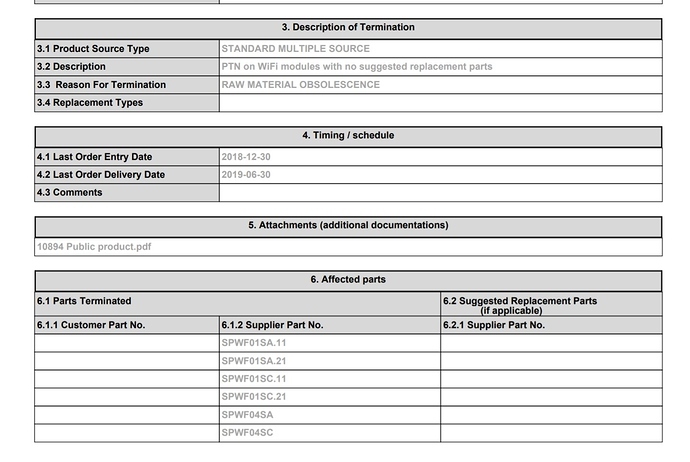 According to the eol report front ST a part used on their module has been eol’d. Somebody asked already… but with no answer from STM. I don’t know. I’m just exploring the module myself. Lol. I wish they can be at least honest about it. It is not easy to find out why unless you know what to search for (SPWF04S PCN). Are these the successors of STM SPWF04Sx ? 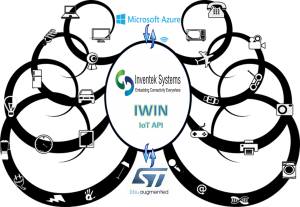 Inventek announces Microsoft Azure cloud support with STM32L4 Discovery IoT kit using the Inventek ISM43362-M3G-L44 802.11 b/g/n compliant Wi-Fi® module. Hi, there is just a discussion about adding some commands to the GHI SPWF04SA WiFi driver. If you could post your commands for socket server applications they could be discussed to be part of an evt. future release of the library. I didn’t work on this lately. I have made an android app to switch the leds on or off and read te status, This works. If you put led1 on on one phone you can see it a few moments later on other phones. Next by pressing btn1 the FEZ becames a AP with a predefined IP address and port number. Once connected directly you can join a wifi network. In that case the FEZ gets its IP from the network. The last 3 digits of the IP4 will be made configurable so that the user know which IP is to be used. Everything work well for some hours and the it hangs in the GHI Wifi driver at an semaphore implementation at overwritten function: WaitOne. I had to look up the details again. The added driver functions are available. Do you want the signatures of the added function or also the implemetations. And where do I make them available? Here? If you have made additional commands that could be valuable for others (e.g. socket server commands) we could ask GHI to include them in the official driver. The implementatation of these functions will be send in the next message. Furthermore the Semaphore class (see below) in the file: Helpers.cs was modified several times without solving the problem. After several hours, depending on the socket requests frequency (more phones / clients sending sockets) the driver hangs. In that case the software loops forever because: this.evt.WaitOne(33, false) allways return false. I have changed form 10 to 33ms and seems somewaht to gelp. When it loops here the board had to be reset to resolve.